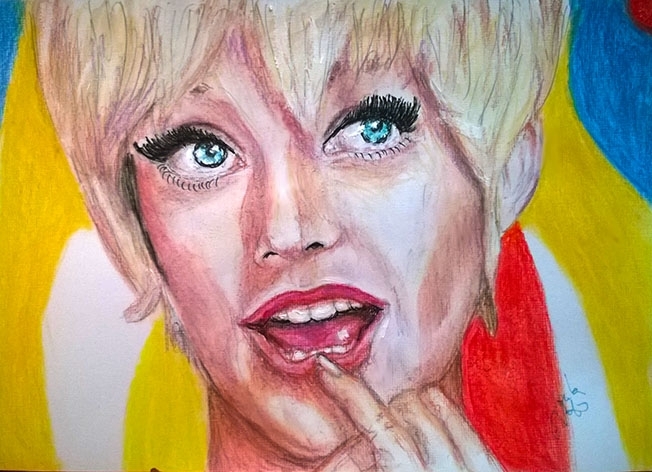 Goldie Jeanne Hawn (born November 21, 1945) is an American actress, director, producer, and occasional singer, who rose to fame on television's Rowan & Martin's Laugh-In (1968–70). She won the Academy Award for Best Supporting Actress and the Golden Globe Award for Best Supporting Actress for the 1969 film, Cactus Flower, maintaining bankable star status for more than three decades thereafter. She is the mother of actors Oliver Hudson, Kate Hudson and Wyatt Russell, and has been in a relationship with actor Kurt Russell since 1983. She founded The Hawn Foundation in 2003. Hawn was nominated for the Academy Award for Best Actress for the title role in the 1980 film Private Benjamin. Other films include: There's a Girl in My Soup (1970), Butterflies Are Free (1972), The Sugarland Express (1974), Shampoo (1975), Foul Play (1978), Seems Like Old Times (1980), Best Friends (1982), Overboard (1987), Bird on a Wire (1990), Death Becomes Her (1992), Housesitter (1992), The First Wives Club (1996), and The Banger Sisters (2002). She is set to star in her first film in 15 years with a role in Snatched (2017). This portrait of Goldie is splendid! You did a wonderful job and you captured her likeness and her essence. Exactly the way she looked on"Laugh In"! Bravo Martha!! I love this actress, she always rejoices every movie. Thank you very much for your kind comment. Un portrait magnifique ! Bravo pour l'expression du regard et pour l'expression de la bouche ! Superbe !!! Great portrait, Marta, capturing her likeness and bubbly character. Groovy! Love her!!! Wonderful portrait! Great emotions! I remember her from the Rowan and Martin Show...such a long time ago!!! So lovely portrait! Superb vivid colors! wow, what a wonderful eyes!!!!! you made another so sympatique artist, a very funny actress whose I remember so many nice films!!! great another time! I loved the result of this drawing. Thank you very much for your comment Ray .